Based in Florida, Martina McAtee has been writing health and fitness articles since 2003. She attended Keiser University, graduating with an Associate of Science in nursing. McAtee is currently working toward a master's degree in nursing from Florida Atlantic University. An autoimmune disorder is an illness in which the body begins to attack its own healthy cells, producing inflammation and an overproduction of collagen, a naturally occurring protein that helps make up connective tissue and maintain skin elasticity. While some autoimmune diseases attack a specific part of the body, many autoimmune diseases can attack several organs in the body. 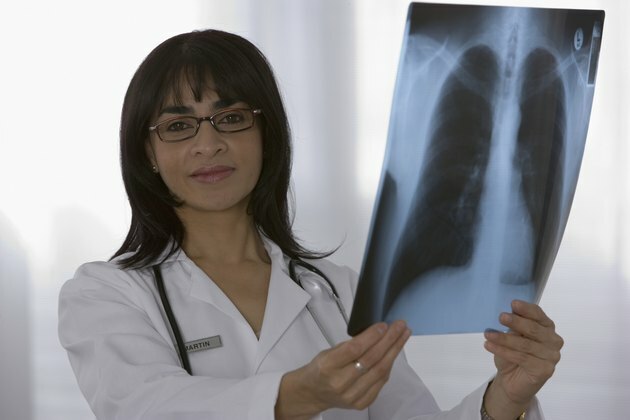 The lungs are one of the most commonly affected organs. Wegener’s granulomatosis is a rare disorder in which the blood vessels become inflamed, restricting blood flow to various organs. Wegener’s granulomatosis most commonly affects the lungs and upper respiratory tract. The first sign of Wegener’s granulomatosis occurs in the respiratory tract, causing shortness of breath. As the condition worsens, people experience constantly runny noses, nosebleeds, sinus pain, ear infections, coughing up blood, skin sores, appetite loss and achy joints and swelling. Early diagnosis and proper treatment speeds recovery times to a few months. Doctors most commonly prescribe corticosteroids to control inflammation. In some cases, drugs such as cyclophosphamide and azathioprine may be necessary to suppress the immune system. Sarcoidosis is an autoimmune disease in which tiny clumps of inflammatory cells develop in different areas of the body. Sarcoidosis most commonly affects the lungs, lymph nodes, eyes and skin. Symptoms vary depending on which organ is affected and how far the disease has progressed. Generalized symptoms include persistent cough, shortness of breath, fever, weight loss, small red bumps on the arms, buttocks or face, as well as arthritis in the ankles, elbows, wrists and hands. Treatment of sarcoidosis may not be necessary if the patient does not exhibit any symptoms. Physicians often prescribe corticosteroids which mimic the effects of hormones in the body that help control inflammation. Scleroderma is a group of rare, progressive diseases that involve the hardening and tightening of skin and connective tissues. According to the MayoClinic.com, 250 people per million have some form of scleroderma. While localized scleroderma affects the skin, systemic scleroderma can attack the internal organs such as the lungs, kidneys, heart and digestive tract. Scleroderma symptoms vary based on where the disease originates but can include gastroesophageal reflux disease which, over time can damage the esophagus. Skin changes may include swelling of the hands and fingers, thickened patches of skin and tightening of skin around the hands, face or mouth. People suffering from sleroderma may also experience an exaggerated response to cold temperatures or emotional stress which causes a constriction of the small blood vessels of the hands and feet causing numbness, pain and discoloration of the fingers and toes. This is known as Raynaud’s phenomenon. There is no cure for scleroderma but treatments can include physical and occupational therapy to help improve movement and strength, cosmetic procedures to reduce the appearance of skin lesions and medications to dilate blood vessels and suppress the immune system response. What Causes Red Blotches on Legs? What Can Cause Joint Pain and Skin Peeling? Can a Vitamin B12 Deficiency Cause Arthritis Symptoms?